Ok, you can thank a colleague of mine (Dinyero Johnson) for this new single vbs script that now copies the taskbar icons and deletes itself. The vbs script is a little nicer than version one (CMD) because it runs without any windows and in my opinion vbs scripts just run smoother :). Also, it is a single file and the tutorial has less steps. So for all of you who grabbed version one, lol, grab version 2!!! And if you are using WIM images, you can simply mount your image, replace the script, and unmount/commit. When running sysprep in Windows 7 with the unattend.xml file, you will probably notice that the taskbar icons are something that don’t copy over. Well that is because the icons are not part of the users profile. So the copyprofile=true command does work for almost everything, but it doesn’t copy over your taskbar icons. So here is a script that will do it for you. You might have to remove the .txt extension when you are downloading the script. You are going to drop this script into the correct place during audit mode. Copy the vbs script into the startup folder in the start menu. Now run sysprep as you normally would and the script is copied into the default profile. That means for every new user, the script pins the icons in the order you want, the script then deletes itself and never runs again. For the correct procedure on sysprepping your machine, read my Windows 7 Sysprep Tutorial. This script is quite inefficient if adding 10+ items to the menu and in different configurations. You should implement a Func to stop reusing code and just feed in a folder and shortcut file. I would like to use your script but edit it to some other apps I have in my office. For example, I want to remove Firefox from yours and add in Cisco AnyConnect, could you please help me with this. You can simply download the file and edit it, deleting the Firefox section and replacing it with a new section for Cisco AnyConnect (path to program), etc. Then design your own script and stfu. How are you calling (runnning) the script..? So the scripts works but placing it in the startup folder during the audit mode does not work. I have spent hours imaging trying to get this to work and no go. My guess is, he is assuming you are using the option in your unattend.xml to copy the current profile that sysprep is run from into the default profile. This way, by putting it into the startup folder of the current profile, it ends up in the default. Could this work for domain profiles? Is there any way to, after adding the machine to the domain, add a number of IE favorites to the desktop? I’m just starting with the sysprep guide and downloading some necessary CAB files for my WinPE setup but figured I’d start reading ahead. How would this need reworked for Office 2013 64 bit? Based on “Guest’s” comment that this was somewhat inefficient at making lots of changes, I changed the script a bit to make it easier to use. I made a separate remove function for the icons you don’t want to re-add and then I consolidated the add and remove functions for the icons you just want to reorder. ‘ shortcut. This is the all programs menu. ‘theitem: The actual shortcut, using the name of the shortcut plus the extension. Quick question.. Why not work with the Taskbar Links section in the answer file? Good point. Feel free to share solution you have in mind with our users. I am trying to use this script to pin Office 2013 (64bit) icons to Start menu and taskbar, but for the life of me, I cannot get it to work. Can you provide any help? Thank You. Is there a chance you can help please? Ran like a charme about 18 months ago. Wanted to use it now with a new machine and all Windows updates included – no chance anymore to get it running. Maybe new windows update or security settings prevent the script from doing what it should? Even if you start it by hand as an administrator NOTHING happens (no unpinning and no pinning)! Hi, thank you for great script, but can you advice me how to also remove “Windows PowerShell” and “Server Manager”. Thank you in advance. Any ideas on how to pin the Chrome App Launcher? It falls under the Google Chrome folder on the start menu. Does this work with plain domain users (non-admins)? Or local accounts only? OK this does the Taskbar, but I wish to do the same thing with the Start Menu. I presume this is possible and just a different command…….Can anyone help please? Also tried looking on the link Wyko ter Haar provided, but it’s unavailable. If anyone is looking for a reference on how to unpin all icons from the taskbar and start menu (regardless of their file names). 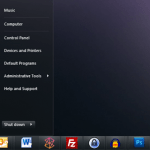 Please see my post here: http://goo.gl/rN4iF2 – You can replace “Unpin from Taskbar” with “Unpin from Start Menu” to unpin the icons from the start menu as well. I think this is a much cleaner solution and I’ve never had it fail on me! Script doesn’t work at all. It fails on the third line with some cryptic syntax error.